Theoretical infinite colours are applied in one application. Complex curves and recesses are printed when decoration by other means is impossible. The heat release decal utilises technology similar to that of the pad printing process to decorate areas that no other process can. 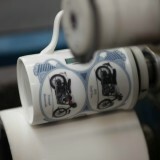 Wax based decals are applied using a silicone pad. Intricate shapes, curves and cylinders are decorated at high speeds. Decorated objects are kiln or lehr ready immediately following application with no need to allow the drying process associated with wet applied transfers.